When people are busy looking for parking spaces, waiting in long checkout lines and overspending looking for that perfect gift, look no further! 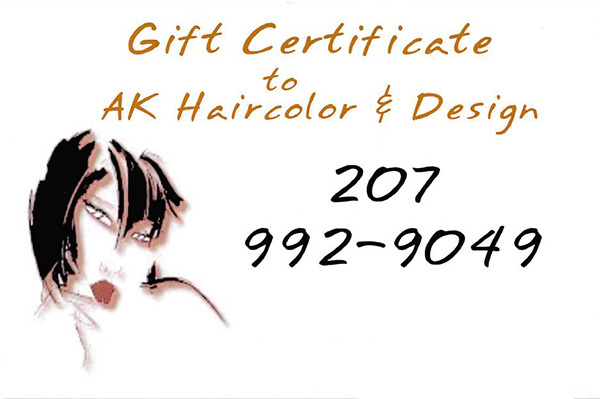 AK Haircolor & Design offers a one size fits all (including budgets) gift certificates! When you work long hours with less and less time available to do the things you love, shopping for a gift can be time consuming. That’s where gift certificates from AK Haircolor & Design makes everything good again! Don’t look any further to put a smile on that special someone's face. Let them choose what services they would like to be pampered with.